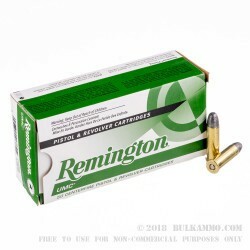 Put holes in your targets instead of your wallet with this economical range ammo from Remington UMC. 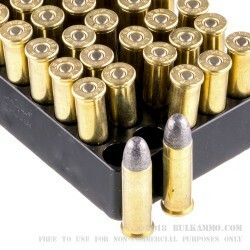 These cartridges fire a simple 158 grain lead round nose bullet at a muzzle velocity of 755 feet per second. This low velocity doesn't hamper accuracy at typical pistol ranges but significantly reduces recoil, making this ammo great for long sessions or training newer shooters. As a standard pressure load, it works well with older or subcompact firearms. Each case contains 500 rounds divided into 10 boxes of 50. 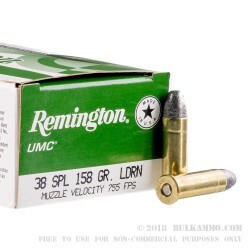 Remington UMC ammunition is made in Lonoke, Arkansas using non-corrosive Boxer primers and reloadable brass cases. 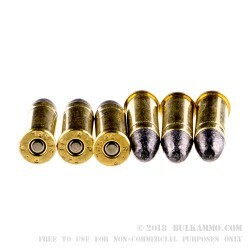 This ammo uses coated lead bullets that may not be suitable for all indoor ranges--check before ordering if you're unsure whether you can use these rounds at your preferred shooting location.